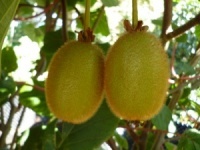 The female form of the Kiwi fruit which should be planted with A.c. 'Tomuri' to obtain fruits. A good reliable self-fertile fruiting variety. The male form of the Kiwi Fruit is strong growing and has large attractive heart shaped leaves. Plant with the female A. Hayward to produce fruit.